In all of the UK, you’d be hard pushed to find a city that parties better than Brighton. Renowned for its vibrant cultural scene, lively residents and burgeoning nightlife scene, it’s the perfect place to enjoy an evening you’ll never forget. But if you’re celebrating in a group of people, navigating taxis and public transport can be stressful. Luckily, that’s where we come in. 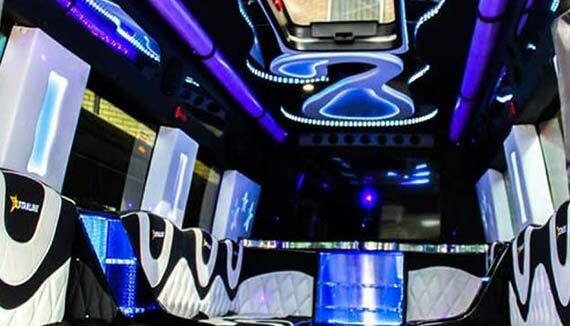 Our party bus hire in Brighton is a fantastic way to explore everything that Brighton’s nightlife has to offer. Want to sip cocktails in the intimate bars of the Lanes, enjoy craft beer in the city’s traditional pubs or dance the night away in iconic venues like Club Revenge, Pryzm or The Haunt? Wherever you’re headed, our vehicles will whisk you there in comfort and style. Whether you’re planning a stag or hen party, celebrating a birthday or just looking forward to a great night out with friends, our party buses are the perfect way to get the VIP treatment all night long. Just take your pick from our excellent selection of vehicles and relax while your personal driver takes you around the best venues that Brighton has to offer. Why not kick back with your friends in a sleek modern bus, enjoying the disco lights and sipping drinks from the on board bar? Or perhaps you’d rather turn heads in one of our amazing retro VW buses? Whatever you’re looking for, we’ve got something to suit every budget and taste. Not quite what you’re after? We’ve also got a fantastic selection of limousines, coaches, sports cars and wedding cars available to hire in Brighton and the surrounding area – just get in touch to find out more.